Call or text anyone in the world for free on Skype. 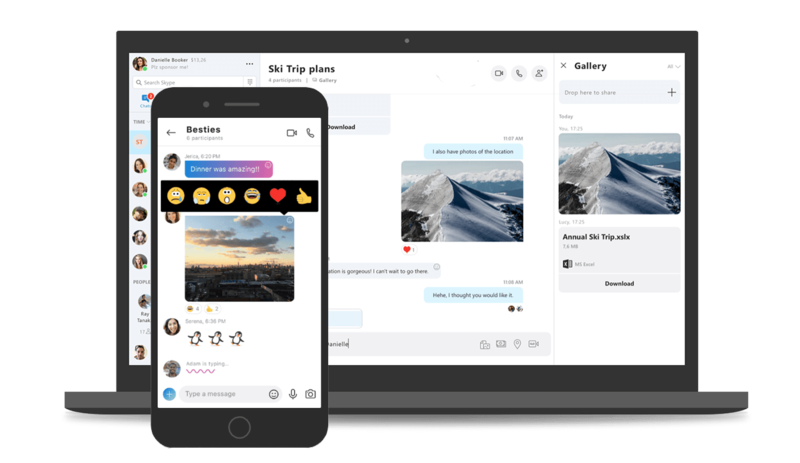 Skype to Skype calling is always free, so go ahead, add up to 50 people (49 plus yourself) to an audio call and get together with everyone on any device. Record your meetings and save it for later. As soon as you start recording, everyone in the meeting will be notified. Final recording is posted in the Skype chat and stays available for 30 days. Live captions & subtitles in Skype enables you to read the words that are spoken during a call. Simply select the More (+) button during any type of call and choose “Turn subtitles on”. No more scrolling through your chat history – just click Gallery under the chat name to see the media, links, and files – you can even sort by type. Keep your conversation and media gallery organized. Delete or edit unintentionally sent messages. Quote or forward message to another converstation. Don't loose track in your conversation. Quote messages from others and reply them directly in chat. You can also forward messages and simply comment on them. Break the language barrier and translate your calls and chats in real time. Our voice translator can translate conversations in 10 languages and our chat translator is available in more than 60 languages. Keep your sensitive conversations private with industry standard end to end encryption. The content of these conversations is hidden in notifications to keep the information you share private.